Centaurium Minus. There are two kinds of this plant, one bearing pale red flowers, the other white; but their virtues are the same. It usually grows with one round and somewhat crusted stalk, about a foot high or better, branching forth at the top into many sprigs, and some also from the joints of the stalks below; the flowers stand at the tops in one cluster. They are of a pale red, tending to carnation colour, consisting of five or six small leaves, very like those of St. John's wort. The root is small and hard, perishing every year. The plant is very bitter in taste. It grows in fields, pastures, and woods. It flowers in July, and seeds a month after. Centaury is justly esteemed as one of the most efficacious bitters in this island. It is often substituted for Gentian, which it much resembles. It is milder than Wormwood, or Holy Thistle. It is an excellent stomachic, both in substance and infusion and celebrated for the cure of intermittent fevers. It is a good remedy for worms; and like camomile, is made into tea for assisting the operation of emetics. As a bitter it is often taken to create an appetite. It removes obstructions of the liver and spleen; and is most useful in the jaundice, dropsy, green sickness, colic. It is very serviceable in obstructed menstruation, in connection with some mild purgative. The green herb bruised is very good for wounds, sores, etcetera. An ounce of Centaury, with two drachms each of Avens, and Angelica, infused in one quart of boiling water, and then add two ounces of Cardamoms�these make an excellent stomachic. Take a wine-glassful two or three times a day. Remember that the long continued use of any bitter impairs the coats of the stomach, and produces an incurable debility of that organ. 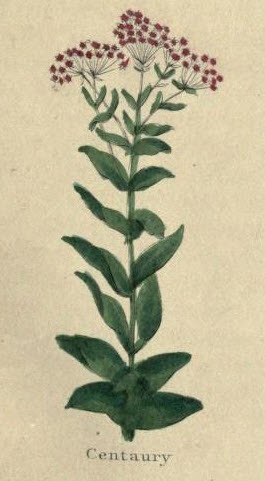 There is, besides these, another small Centaury, which bears a yellow flower, like the former, save that the leaves are larger, and of a darker green. In diseases of the blood, use the red Centaury; if of choler, use the yellow; but if phlegm or water, you will find the white best.